The Ministry of Education and Technical Education recently kept its promise by distributing tablets to grade 10 students. 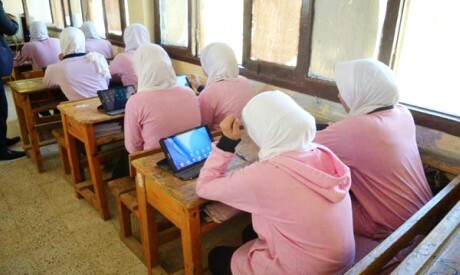 Tablets numbering 708,000 were sent to around 2,000 schools in 20 governorates. The ministry is introducing tablets as part of its plan to reform and digitise the educational system. Through tablets, students will be able to access their curriculum. According to Amina Khairi, spokesperson of the Ministry of Education, students will have the opportunity to access the Knowledge Bank via the tablet. Educational content on the tablet is translated into Arabic and English. Schools have been provided with high speed Internet networks. Moreover, every school has its own server in case something goes wrong with the Internet, Khairi said. Tablets have been distributed to private, governmental and experimental schools. International schools will not receive tablets since they have a different curriculum. Teachers and supervisors will be provided with tablets having different content than that of students. According to Ahmed Daher, adviser to the Ministry of Education for Information Technology Affairs, tablets are fully protected and impenetrable. It will protect students from becoming victims of immoral practices, including accessing websites with immoral content, he said. Each student must pay LE100 annually in insurance to receive the tablet. The amount is paid at the post office. Students and teachers are obliged to pay, Daher said. “The ministry is looking to put in place a mechanism that would encourage students to buy the tablet after some of them have shown displeasure at having to pay insurance,” Daher said. If a tablet is ruined due to misuse in a way that it cannot be fixed by the teacher or the student before the three-year insurance period is up, the student must pay LE4,500 to receive a new one. Students must return the tablets after completing their secondary stage and before joining university, Daher said. Parents or students are to sign a form before receiving the tablets committing them to return them after the identified period, he added. The Ministry of Education is currently trying to solve the problem of schools that use foreign languages in studying, such as French and German. They will not receive tablets until a solution is found for them, Khairi added. Daher said students who will sit for the March exam will take it on the tablet. “They have been trained on them throughout the past month,” he confirmed, adding that more than 300,000 teachers were trained on using the tablet. Teacher Mohamed Mahmoud believes the use of the tablets will contribute significantly to changing students’ attitudes and will encourage them to seek education. He said it fits with their eagerness for technology. “The new experience is addressing their minds and moving them from memorising to understanding, however, it will take time to train the students, ” Mahmoud said. Shorouk Mohamed, a grade 10 student, wants more time to get used to the tablet before she has to use it to take an exam. “One and a half months of training is not enough,” Mohamed said.